When last we checked it was nearly two decades into the 21st century, and yet women remain unallowed to enter stadiums to attend men’s football games in several countries. From a European perspective, would we tolerate a Spanish man being able to bring his son to attend a Real Madrid match, but have his daughter barred from the Santiago Bernabéu by security guards because of her gender? The idea is laughable and yet gruesome at the same time. While we are at it, imagine if this girl were not allowed to watch the game and support her team with her friends, male or female, at either at a sport bar or café. Now imagine that Spain hosted France in an international friendly, and that it were permissible for French women to enter the venue but not Spanish women. Is that not infuriating? Yet this has been the situation for decades in two countries. Since Saudi Arabia constitution was drafted, women have not held many of the rights enjoyed by men, including the ability to drive and enter sports arenas. Since Iran’s revolution in 1979, Iranian women have not been allowed to attend men’s football games, with officials hiding behind the vulgarity used by male fans as an justification. This leaves the top-ranked FIFA nation in Asia with roughly half of its 77 million people unable to set foot inside a stadium. This discriminatory mandate hurts even more when one considers that female fans or reporters of other nationalities can freely attend matches in these countries: Syrian women with scarves were allowed into Azadi Stadium for a World Cup qualifier against Iran, but Iranian women were not extended the same right. The same rules were until recently the law of the land in Saudi Arabia, which welcomed female supporters of Western Sydney Wanderers – accompanied by male family members – to the AFC Champions League final against Al Hilal. the arena. Several Iranian women have gained international acclaim – and local ire – by impersonating men in order to sneak into local stadiums, wearing multiple layers of clothing and even fake beards. Their posts to social media have inspired debate amongst football fans and criticism toward the Iranian and Saudi football associations. Yet there has been some forward movement. As part of sweeping new progressive reforms which began months ago with a lifting of the ban on female drivers, Saudi women were allowed earlier this month to attend sporting events. 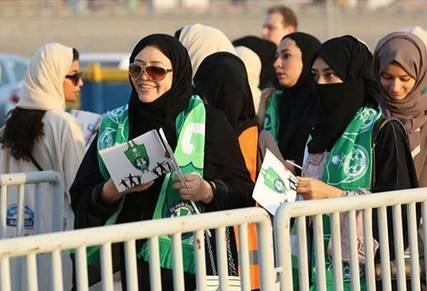 The match between Al-Ahli and Al-Batin on January 12 was historic in many ways, with the jubilant smiles of Saudi women lining up at ticket gates beamed across the world. 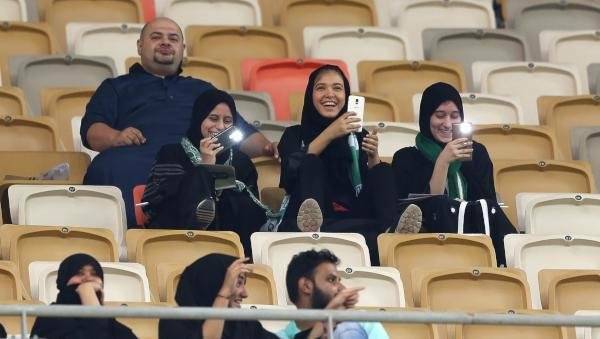 As those fans took selfies with their friends from inside the stadium, young Iranian women watched in admiration and envy, wondering if the right enjoyed by their mothers would ever be returned to them. As the top-ranked AFC nation heading into the 2018 World Cup, we can only hope that Iranian officials, now under an even more intense spotlight, will finally put an end to the discriminatory and sexist practice against their own countries’ female football fans. If they cannot see the writing on the wall, the onus falls on FIFA to enforce their own standards on their member associations. Saudi women did not deserve to wait 62 years to re-enter the terraces, and nor should Iranian women need to wait 40 years to experience the joys of football in the stadium. Niloufar Momeni is a commentator on Iranian football and regular contributor to Football Tribe Asia.